“I’ve become the largest buyer of fridges in the world,” the British Secretary of State for Health and Social Care said. 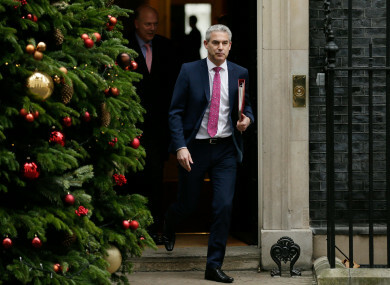 Brexit Secretary Stephen Barclay leaves 10 Downing Street after the last cabinet meeting before Christmas. BRITISH MINISTERS AGREED to make no-deal Brexit planning “an operational priority” amid continued opposition to Prime Minister Theresa May draft divorce deal, just 14 weeks before the country leaves the EU. Following a meeting of her cabinet – the last before parliament breaks for the Christmas/New Year break – Defence Secretary Gavin Williamson said around 3,500 troops would be on standby to help deal with the “any contingencies” from a no-deal outcome. According to the Times of London, a document that was leaked to them indicate that the government is being told to prepare in the event of a no-deal for a rise in “homelessness, poverty and suicide”. Secretary of State for Health and Social Care Matt Hancock told BBC Newsnight that there were plans to store six weeks of stockpiled medicines for the NHS in the event of a no-deal Brexit. “I’ve become the largest buyer of fridges in the world, I didn’t expect that,” he said. But Brexit Secretary Steve Barclay said ministers still hoped to secure backing for May’s agreement in a House of Commons vote delayed until next month. He added that any responsible government would intensify preparations for the “default option” of leaving the European Union without a deal on 29 March next year. May’s cabinet is divided between ministers who want the government to embrace a no-deal outcome and those who favour parliament having a final say in a series of votes on potential scenarios for Brexit. One option is the prime minister’s own Brexit deal, but that is hanging by a thread after she was forced to pull a vote on it last week in the face of huge opposition from within her own Conservative Party. Earlier today, Downing Street reportedly blocked opposition leader Jeremy Corbyn’s request yesterday for a non-binding no-confidence motion in May. That had followed her telling MPs they will not get to vote on her deal this week, but instead in the week beginning 14 January. The delay prompted accusations she was stalling to increase pressure on MPs to back the plan – and fresh calls for Labour to table a binding no-confidence vote against the whole government. However, such a move faces likely defeat after Conservative Brexit hardliners and the Democratic Unionist Party, which props up her government, both said they would back May. May insisted Monday that she was continuing to seek “assurances” from the EU over elements of her plan, although EU officials said no meetings were planned. The postponed vote has left members of her own party and Labour opposition politicians infuriated. “The prime minister has cynically run down the clock, trying to manoeuvre parliament into a choice between two unacceptable outcomes” – her deal or no deal, Corbyn said. May is also facing calls for a second referendum to resolve the impasse, with dozens of MPs from all sides now supporting another poll and reports that May’s officials are also considering the possibility. But the prime minister argued that this would betray the 2016 Brexit referendum result and undermine public confidence in politics. “Let us not break faith with the British people by trying to stage another referendum,” she told parliament yesterday. “Another vote… would do irreparable damage to the integrity of our politics,” May said, adding that it would also “likely leave us no further forward”. Email “A glimpse at UK's no-deal Brexit plan: 3,500 troops and fridges for medicines”. Feedback on “A glimpse at UK's no-deal Brexit plan: 3,500 troops and fridges for medicines”.